In last week’s blog I talked about fear and how it can really cripple us if we don’t learn how to have a healthy relationship with it. Fear is a part of life – we cannot avoid it – so the best way forward is to make friends with it and utilise it as a force for good. The sort of fear that I am referring to is not the “walking in a dark alley at night” sort of fear but more the “I don’t think I can do it” fear, or the “If I speak up, I might get laughed at” fear. This type of fear is what keeps us small, not ever reaching our full potential, and ultimately changes the direction of our lives. Some people spend their lives trying to avoid fear, in fact they are so fearful of fear that they live in a continuous and constant state of fear! Ironic really. Facing off with fear can be a truly liberating experience. It gives us the chance to create powerful evidence that we can act in spite of fear or worry, that yes, we can do it! People who are successful in life, no matter what area that is, have come up with ways to engage with their fear and use it as vehicle to create change, innovate, be courageous or just make amazing things happen. Like anything in life, having a plan or strategy of what you can do to help you move through an emotion is always extremely useful, particularly with fear. Because of the physiological response to fear, it can easily paralyse us if there is no plan in place. The Five Second Rule – The Five Second rule is the work of Mel Robbins and it is a truly powerful tool! It is a very simple technique where we are harnessing the fact that our brain will start talking us out of doing something within five seconds and if we don’t act within that time, more than likely the moment is lost. Robbins discovered this tool over ten years ago when she was in a highly unmotivated and fearful place. Everything was going wrong in her world and she literally couldn’t get herself to take action on the matters that were most important to her such as her family, her health, her finances, her career and her happiness. The reason I love this rule is because it is SO simple! The way it works is like this: an idea pops into your head (for example putting your hand up in a meeting with your peers to share an idea; a new business idea to further expand your business; or getting out of bed and not hitting the snooze button) and you literally count down from five to one and then take action on it. By counting down in this way, it activates your prefrontal cortex. Your prefrontal cortex is the part of your brain that makes decisions, plans and works toward goals. When you count backwards, 5, 4, 3, 2, 1 – you take control of your prefrontal cortex instead of letting it control you. That simple act of consciously taking control of your decision-making process creates “activation energy”. The energy it takes to get something started is much greater than the amount of energy it takes to keep something going. It’s that first step that’s the doozy. That’s where the Five Second Rule comes in to help you retrain your responses. Replace that initial “negative” or “unproductive” instinct with a positive one and you’ll develop new neural pathways that result in lasting behaviour change. You’ll become a doer, instead of a thinker, and when fear is involved that is crucial! Appreciation and Gratitude – In his book, What Happy People Know, Dan Baker explains that it is impossible for us to experience fear or anxiety and appreciation simultaneously. This is a great little brain trick to help us manage fear in the moment and move out of it so we are able to take action. “During active appreciation,” Baker writes, “the threatening messages from your amygdala (the fear centre of the brain) and the anxious instincts of your brainstem are cut off, suddenly and surely, from access to your brain’s neocortex, where they can fester, replicate themselves, and turn your stream of thoughts into a cold river of dread. It is a fact of neurology that the brain cannot be in a state of appreciation and a state of fear at the same time. The two states may alternate, but are mutually exclusive.”. What this means is that when we experience fear or anxiety and we are able to consciously move ourselves to a state of appreciation and gratitude, the fear must diminish. Pretty exciting hey! I love this strategy as it is again super simple and also conditions us to become even more appreciative of our lives. Future Pacing – Future pacing is a Neuro-Linguistic Programmingtechnique that utilises the fact that the mind cannot tell the difference between imagination and current reality. By imagining something so fully and deeply as if it were real, the mind then acts as if the change has already taken place. It accepts the imagined situation and then goes forward to create it. In practice, future pacing techniques include having a person first imagine a new and improved change further out in time. By using your modalities – visual, auditory and kinaesthetic – you simply imagine what you would see, what you would hear as well as feeling the feelings that would occur if the event was successful. By turning these up and really connecting with them, we create a strong image in our minds which our unconscious mind accepts. Future pacing is a great strategy to use when we have an event coming up that we feel nervous or fearful about. We can literally practice the event in our minds eye and train our unconscious mind to create that event for us. This reframes our fear of getting it wrong or stuffing it up into a learning opportunity. If it doesn’t go how you want it to or it fails, then you have received feedback, powerful feedback because you can now do it differently. This is where innovation lives – the innovators are the ones that live by this rule. Thomas Edison, the inventor of the incandescent light bulb, said “I have not failed, I just found 10,000 ways that didn’t work”. He absolutely had the philosophy that there is no failure, only feedback. There are so many successful people that live by this principle including Michael Jordon, Oprah Winfrey, J K Rowling, John Grisham and Eminem. Challenge it – So often we accept what our mind tells us. Whatever the little voice of fear is saying, it’s most probably not true. Yet we don’t naturally challenge these thoughts. We buy into them and then let them dictate our behaviour. The fearful part of us is irrational and overprotective. Its intention is pure but it doesn’t see us in all of our greatness, it just wants to keep us safe. It might be saying you are likely to fall flat on your face if you take a risk, or that no one will like your ideas, it’s far better to stay quiet. It might be saying that moving to a new city could hurt your children and you don’t want to screw them up! Or what about leaving your safe and secure, yet horribly boring job? Imagine all the bad things that would happen if the new job is worse? Unless we challenge these thoughts, we will accept them and behave in alignment with them. Sure, we may stay safe but, gee, we also stay pretty small! This strategy is around questioning and examining those fear-based thoughts. Ask yourself, “Is what this voice is saying true?”, “What could be another alternative to the one I am currently thinking about?”. I trust that one or more of these strategies are useful for you in growing your relationship with fear. 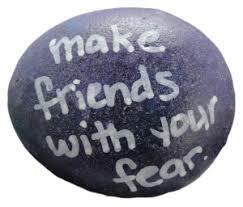 Remember that fear has a great intention – it is just trying to keep us safe. So often though, safety and greatness live in different places. Previous articleBreaking throughAre you willing to make friends with FEAR? Next articleBooksAre you ready for an exceptional year? You are so clever Kate.